Drew Metzger and I, ably helped by Sam and Randy, have been assiduously working on various Ogre projects. Here's an overview. The Kickstarter Ogre projects have been comparatively more successful than the non-Kickstarter ones. We clearly have a focused and relatively small fan base; that tells us that further projects should be Kickstarters. But let's enlarge that fan base. If you have a friend who likes hex boardgames, play Ogre with him and spread the word! Set 1 is almost ready to start production. There have been delays (very educational delays), but we are moving forward. We have all the CAD files for Set 2, and plan to launch the Kickstarter once we have shipped Set 1. The Set 2 Kickstarter might be combined with . . . The big supplement promised in the original ODE Kickstarter. Battlefields will include two GEV-type maps, G3 and S3. There will be two sheets of counters, with new things to blow up and new Ogres (Ninjas! Finally!) to blow them up with. Stretch goals will include an overlay sheet, mostly swamp and water (since that was in short supply in ODE). Equally cool: Battlefields will include a complete and expanded ODE rulebook, 32 pages long, which takes all the new units and other material and puts it in the context of the original ODE rules. Moving forward! We are at milestone 11 of 14, and if there are no hiccups, we will see a Steam release in October 2017. We are very happy with the graphics Auroch has developed, and we are looking forward to testing the game interface and matching wits with the AI, both in the classic scenarios and in a brand new, ten-level campaign written by Drew, with creative interference by yours truly. 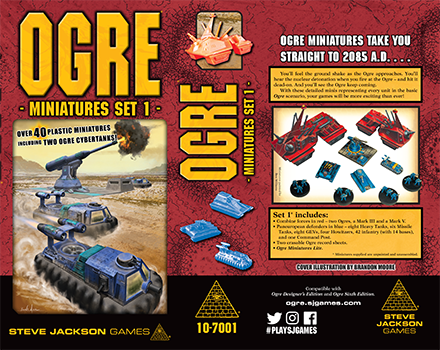 That might not be the name, because we are still hashing out details, but we are thinking about Kickstarting a project to do a collection of Ogre articles curated by Drew. 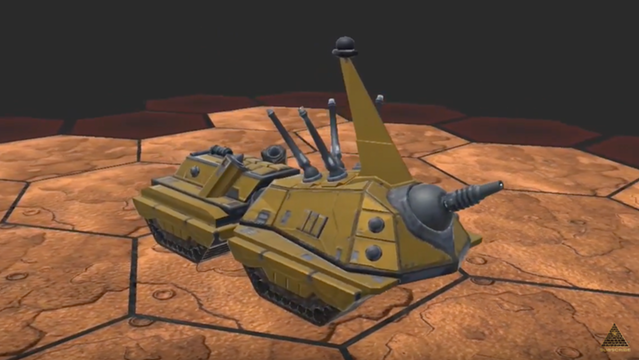 This is a further test of Ogre support on Kickstarter, as well as an excuse to create some short material for you. If it goes well, it might even become an annual thing. This is progressing nicely. A campaign of scenarios set deep in the Factory States era has been developed and is being checked and tested. Expect further updates on this soon.